I say "fan" because a) being a Mariners fan is to subject oneself to the sort of heartache that can only result from the type of play Seattle's low-scoring, injury-prone team gives us and b) the study uses Facebook "likes" as its sole source of information. Believe it or not, there are people who don't like their favorite baseball team's Facebook page. Also, some fans don't even use Facebook. 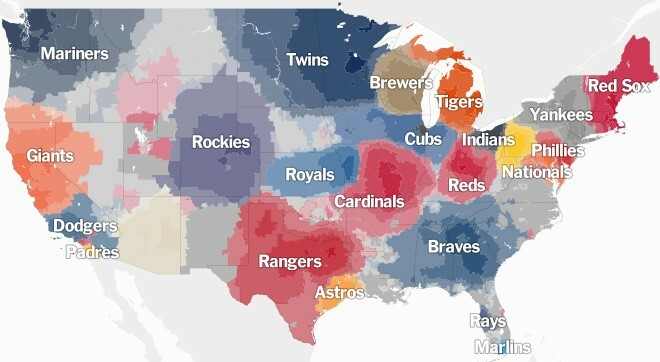 Regardless, the map gives us an awesome county-by-county look into the baseball allegiances of our nation. As it turns out, a lot of people like the Yankees, which is disheartening. 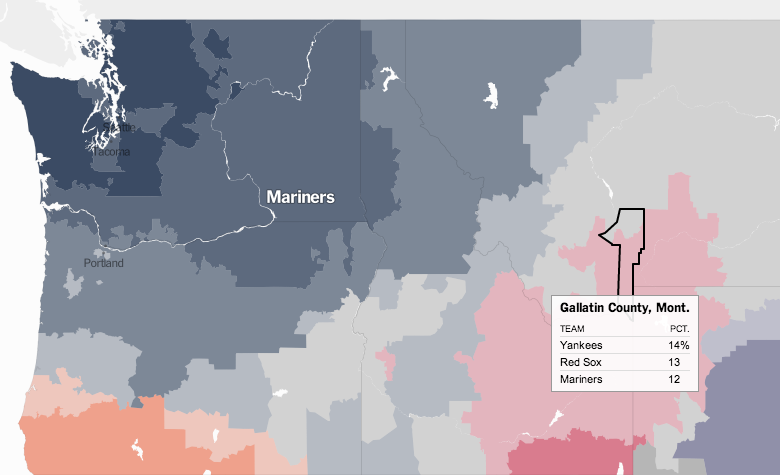 It's fine to like the Yankees if you're from the greater New York area or your parents or grandparents were Yankee fans, but for the 14 percent of Facebook users in Gallatin County, Montana, who make the Yankees that county's favorite club? No, not cool. I often liken this to watching Rocky IV and cheering for Ivan Drago. Here in Spokane County, 43 percent of Facebook users prefer the Mariners. The Red Sox came in second, followed by, you guessed it, the Yankees. If you really zoom in, you can see how each zip code identifies. Play around with that map. It's pretty fun. What you notice about this immediately is that the Mariners' Nation is remarkably large in geographical terms. But that's not that useful for the franchise because cows and evergreen trees don't watch baseball. Also, the Mariners (no longer on a losing streak, BTW!) play the Yankees in New York for a three game series starting on Tuesday.